Rural Karnataka has a lot to offer for travelers visiting for weekend breaks. Over the years number of accommodation providers in different segments have increased. These village stays are a must for city dwellers to getaway from their ever tiring work routine. You will spending a small chunk of your hard earned money for a real rejuvenation experience. Countryside Karnataka is well known for nature holiday destinations for travel enthusiasts. The rural homestays in Karnataka listed by TravelMalnad are the best in the market. The team has strived more than 15 years for creating happy travel community visiting Karnataka. Indians and foreign visitors of TravelMalnad.com listed homestays and resorts have appreciated the services. All bookings made till date are 100% safe and secured. Your confirmation vouchers has flexi pay option, cashbacks, safe cancellations and no surprises at the property. The reason for travelers to love our services has derived from several factors. We are not bulk room selling attitude companies who care only for volumes. We care for quality of services & experience offered by our verified hosts. The homestays are resorts listed under Travel Malnad are thoroughly pre checked. The hosts and managers at the properties are highly qualified with a passion for tourism & hospitality. 10 Top reasons to choose travelmalnad.com for homestay and resorts or hotel booking in Karnataka. Authentic service providers: The listed homestays & resorts are run by passionate owners/hosts/managers. They are in the business to promote destinations. We are working only with the top ranking hosts. Easy and secure booking: Travel Malnad in last 15 years till date has no booking complaint. All reservations are done transparently by host acceptance of booking. So no complains of “No Room Situation” till date. We take pride in serving our guests as our own friends and family. We are building an awesome travel community not “Customers”. Check availability & Book: We make sure that all your reservations/payments happen only with assured availability. Once booked the reservation voucher is a valid document for your trip. Visit the destination peacefully and check in any time with our flexible check in policies designed to help our guests. Your bookings/payments are accepted only with 100% availability confirmation. Secure website: TravelMalnad.com is a fully digitally secure website for your bookings & payments. Thousands of host list their property happily to take their guest bookings safely through us. None of your personal information can be accessed by any third parties. We care your trip: The promoters at Travel Malnad are extensive travelers themselves. They have been so passionate in fine tuning your trip planner experience. All services are added with thorough background check. We care that your trip should be awesome. 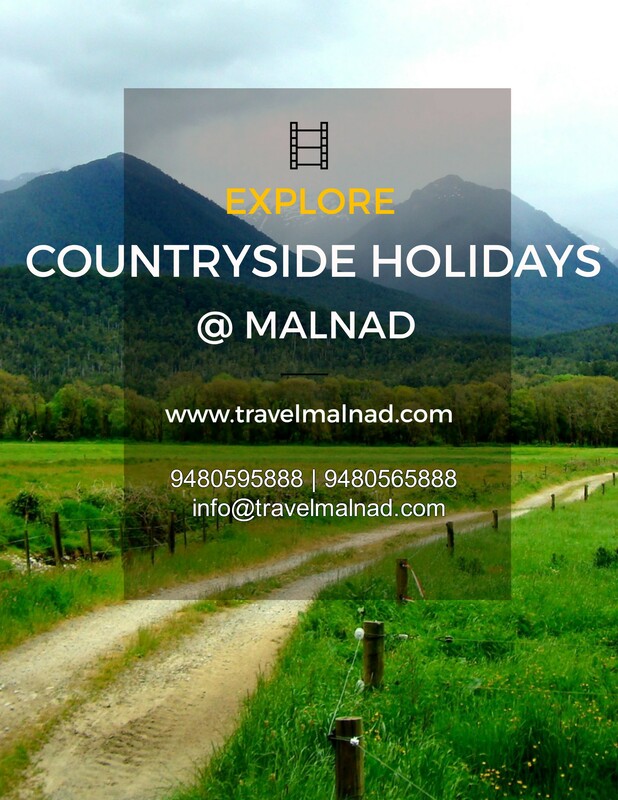 Copyrights Registered Brand: Travel Malnad is a copyrights & intellectual property rights registered brand. The brand is verified by legal parameters and given the ‘Registered’ status. We take utmost care to give you the best holiday experience. Book in 5 Minutes: Once you are done with comparison & analysis, take a free quote. It takes less than 5 minutes to process your query. You can book quickly without wasting your valuable time. Malnad cuisines: We are happy to announce our guests that our hosts prepare best Malnad Cuisine in Karnataka. Your taste buds will feel happy & smiling. Food is customized to your taste & preferences to make sure you have a happy tummy during the trip. Corporate / Group Event Holidays: We are the pioneer company who organizes live music, Yakshagana, Dance Performances, Destination Weddings… for you. We are the only company who offer combo package for those looking for both holiday & events clubbed. 100% Trusted Partners: We are in the industry for more than 15 years now. Our partners are with us from our early days. They are serving our guests with same spirit and passion as they did in the beginning. Your reviews and feedbacks keep us all motivated. The homestays, Resorts & Hotels working with us refer their friends and partners to work with us after appreciating our work culture. Till date we don’t have a single payment or booking complaint by any of our partners. Last but not the least “ Travel Malnad is serving the guests to make them happy, because your holiday is your most precious time you saved for your friends & family”. We respect that precious time of yours and we continuously strive to make our services better. We are a small team of passionate travelers helping fellow travelers have the best holiday experience in Karnataka. Travelers love us because ‘We do not advertise fake promotions only to lure website visits or increase CTR’. We offer best discounts for every booking without compromising or cutting down any of the services offered in the package.